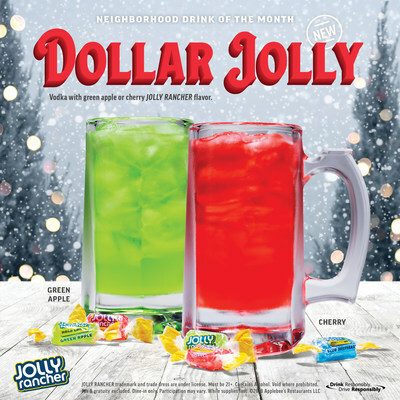 GLENDALE, Calif., Nov. 30, 2018 /PRNewswire/ -- The Applebee's®December Neighborhood Drink of the Month, the DOLLAR JOLLY, has come to town – one day early. Starting today at participating Applebee's restaurants nationwide, celebrate the spirit of the season, with this vodka-based cocktail cheerily crafted with Cherry or Green Apple JOLLY RANCHER mix for just one dollar. A JOLLY RANCHER hard candy is served on the side as an extra jolly treat.